This time I had Jeffrey and Marissa in the studio to do a couple shoot. Since I usually do shoots with one person at a time, this seemed like a cool idea to do so. Variety is the spice of life isn’t it? 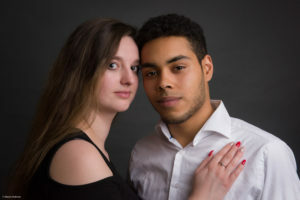 Since Marissa has a bright skin tone and Jeffrey has a darker skin tone we decided to use contrasty clothing to make the images more appealing to the viewer. So Jeffrey used a white shirt and Marissa had a black outfit. I think that worked out great. During the shoot, the couple did a great job doing some nice poses and the results came out nicely. For this shoot I used a studio strobe with a big octabox to achieve a better light spread over the couple. Because Jeffrey has a darker skin tone then Marissa, he was positioned closest to the light source. In that case, the tonality was spread out more evenly in the image. So thank you Jeffrey and Marissa for being such a lovely couple. We had a great shoot.